Periodontitis is a serious gum infection marked by painful, irritating symptoms that make it challenging to eat, swallow, and speak. Although prevention is important, many people fall short because it typically involves cutting out sugar and spending more time brushing, flossing, and rinsing. Periodontal disease begins with gingivitis, and progresses if steps aren't taken. What's surprising is recent research has shown a strong association between nutrition and periodontitis risk, particular when it comes to vitamin B12 deficiency. A new study has revealed the startling connection between vitamin B12 and periodontitis, a reversible condition commonly referred to as gum disease. 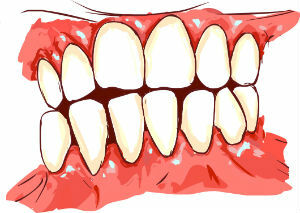 In particular, an inverse association between serum vitamin B12 and the progression of gum disease and tooth loss risk. In other words, the lower a person’s B12 levels, the higher the risk of tooth loss and advancement of periodontitis. While the researchers weren't clear as to how this association manifests, it's clear that nutrient quantity and quality affect dental health far more than previously realized. One theory to explain this association is that because B vitamins are used in sugar metabolism, a high-sugar diet may deplete vitamin B12 while simultaneously increasing periodontitis risk. Also, B vitamins, like B12, are involved in wound healing, and decreased intake may delay the repair of gums. Another theory is that people who have poor dietary intake from the get-go are probably less likely to be consuming adequate amounts of B12. These individuals are also more likely to eat high amounts of sugar, a key contributor to gum disease. Perhaps the best prevention method for gum disease is to simply avoid sugar. Refined sugar affects virtually every aspect of your health, so it's good to abstain from this nutrient-void food. Although it’s not prevention, turmeric may be helpful for reducing the irritation that accompanies gum disease. Research shows the antioxidants, among other compounds, in turmeric are helpful for promoting healthy gum tissue. And, of course, proper brushing and flossing on a daily basis is necessary to prevent plaque and bacteria buildup. Have you encountered gum disease? Were you able to approach it with natural methods? What were your results? Please let us know in the comments! Zong G, Holtfreter B, Scott AE, et al. Serum vitamin B12 is Inversely Associated with Periodontal Progression and Risk of Tooth Loss: A prospective Cohort Study. J Clin Periodontol. 2015 Nov 27. doi: 10.1111/jcpe.12483. Monika Nagpal and Shaveta Sood. Role of curcumin in systemic and oral health: An overview. J Nat Sci Biol Med. 2013 Jan-Jun; 4(1): 3-7. The post The Surprising Link Between Vitamin B12 and Periodontitis appeared first on Dr. Group's Natural Health & Organic Living Blog.